Gosh, it seems like forever since I wrote a blog post - a month in fact. Well, Happy New Year and all that. I'm always so glad to see the back of the holiday season. I guess that makes me a proper Grinch, eh? We had a good time with family in spite of an awful cold Bill brought home and shared. We are finally recovering and I have lots of ideas for 2017. French Fashion Design Paper Dolls 1900-1950, Tom Tierney. This was a big surprise from my friend, Lucy. I don't think I will be able to bring myself to cut them out, but they are absolutely spectacular. She knows just what I like! Half-Yard: Home, Gifts, Christmas, Heaven (4 books), Debbie Shore. I originally saw one of these at the National Trust shop at Knole and was sorely tempted. Instead, I came home and put it on my Amazon wishlist and found a couple of others. I have to say there is a fair amount of repetition in these books, so if you got one or two it would probably be enough. I hope to dive into them at some point during the year and if I can recommend one or the other, I will report back. A New Genealogical Atlas of Ireland, Brian Mitchell. This is pretty much a book of maps and it is all fairly confusing, which is one of the reasons I wanted it. The administrative areas of a country can be those defined by any number of bodies: Poor Law Unions, Catholic Church, Anglican Church, etc. Knowing the right name of the area in the right database can save a lot of time and effort. I can see I need to designate a bookshelf to genealogical resources. Homemade Gifts Vintage Style, Sarah Moore. Another temptation at a National Trust shop. It looks lovely! The Buildings of Northumberland, Nikolaus Pevsner and Ian Richmond. Bill and I often get each other books we both can enjoy. Some one laughed that I bought Bill a JK Rowling and a Jill Paton Walsh book, each that I was looking forward to reading. We both agree that it makes perfect sense to do this sort of thing, given the limited space we have. I can see us planning some days out using this book and another that Vivien gave him, about historical walking tours in Northumberland. Starting to Make Bead Jewellery, Julie Ashford. I have jewellery making tools, including a drill I got for Christmas. I have tons of old jewellery, begging to be re-made into something wearable, and a jar full of sea glass and shells. And now I have some basic instructions to get me started. I saw a wonderful book of design in a National Trust shop, but didn't take note of the title and author, sadly. I know loads of crafters who are very skilled at making things, but don't trust their design capabilities. I count myself among them. Winter's Bone, Daniel Woodrell. I know most folks read a book and then look forward to the film. I like books probably slightly more than I do films and so when I saw that the Jennifer Lawrence film of this title was made from a book, it went on my wishlist. I expect it will be fairly gruesome, mind. A Man from Donegal, James Harley. It is a simple narrative of someone who is bound to be a distant cousin, though I doubt I'll ever be able to connect us up. Still, I thought it was worth reading. So many books I don't really need to own, but I really want to read them. Our local library is pretty much dedicated to chick lit and graphic novels, whatever those are. A Circle of Sisters, Judith Flanders. I spotted this at Bateman's. The four MacDonald sisters in the book are married to Rudyard Kipling, Stanley Baldwin (a Prime Minister), Edward Burne-Jones (a Pre-Raphaelite painter) and Edward Poynter (a president of the Royal Academy [of Arts]). Loads of history waiting for me here! Inheritance, Robert Sackville-West. If you read the posts about Knole, you'll know about this book. I'm hoping that it's been long enough (and heaven knows there has been enough information stuffed in) that I won't remember too much that this is 'old news'. Somehow I think that's unlikely. The Terrible Knitters of Dent (video). This was a surprise from Helen, Bill's eldest. I see I haven't yet blogged about our Thanksgiving in a rented house in Dent... Anyhow, we went for a walk and then had tea and toasted teacakes at the museum in Dent. I had to leave to go put the turkey in the oven and so didn't get to tour the museum with the others. Bill and I watched this last night. It is mainly a couple of elderly ladies, the last of the 'terrible' (meaning, amazingly good) knitters telling their stories. 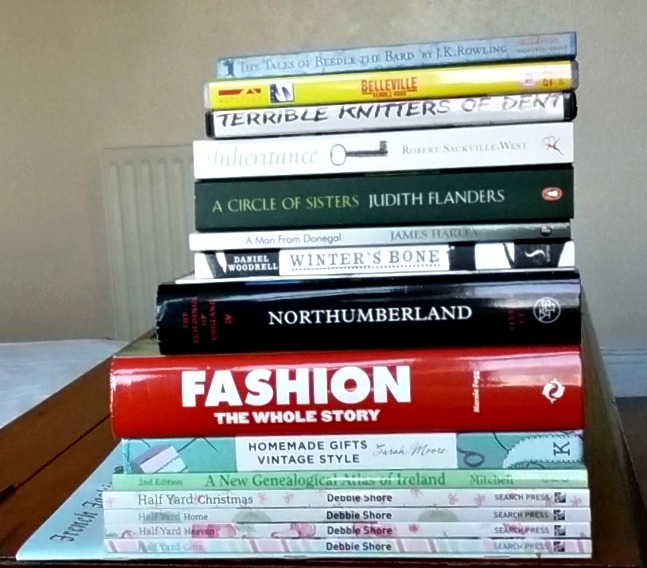 I'll have to write about the terrible knitters some time, but meanwhile you can read about them (there are some videos there, but most of you will need subtitles...). Belleville Rendevous (video). This has another name, the Triplets of Belleville. If you haven't seen it, you really must. Simon first showed it to us back when we visited him in St Paul Trois Chateau in 2012. We saw it again at Ben's flat when we were cat sitting in Nice. I found it on Youtube once but really thought we should own it. Bill is picky about what he will watch and this is one he will sit still for. I wouldn't say it was a children's cartoon, mind. We watched it New Year's Eve. The Tales of Beadle the Bard, J.K. Rowling. I can't believe we don't already own every single thing she's written. If this is a fraction as good as the Harry Potter books, I will be well pleased. Albion's Seed: Four British Folkways in America (America: a Cultural History), David Hackett Fischer. This was a book recommended by a cousin (or to him, I forget which). It purports to describe four separate waves of immigration from four different areas of Britain to four different areas of America and to show how the regional culture of those parts of Britain impacted the development of regional culture in the US. I am currently reading about the Puritans who colonized Massachusetts from East Anglia. It is a very academic book with loads of footnotes, but I'm loving it all the same. What a great stack of reading material! I love the diversity of interests here. Enjoy!